Provide comfort for the family of Mary Arnett with a meaningful gesture of sympathy. 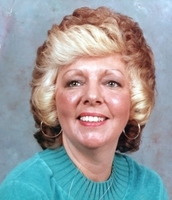 Mary K. "Kaky" Arnett, age 82, of Wooster, passed away, Sunday, March 31st, 2019 at Magnolia Sanctuary Health, in Wadsworth following a period of declining health. She Was born on July 12, 1936 in Wooster to George and Lexie (Blankenship) Robison and has been an area resident for all of her life. Mary worked as Produce Manager with the former Sparkle Market in Wooster for 32 years. She married William A. Arnett who passed away in 2000. She participated in the Red Hat Society in Wooster for many years; enjoyed bowling and was an avid traveler especially during her younger years. She is survived by a daughter, Kimberly (Joel) Sanderson of Wooster; grandchildren, William "BJ" (Staci) Sanderson of Norton and Ryan (Jennifer) Sanderson of Chicago; 3 great-grandchildren; many nieces and nephews and other special family relationships. In addition to her parents and husband, she is preceded in death by her brothers, Thomas and Gerald Robison. Memorial services will take place on Thursday, 7:00 p.m. at Custer-Glenn Funeral Home in Wooster with Pastor Don Bolich officiating. There will be a private interment which will take place at Wooster Cemetery at the convenience of the family. Memorial contributions may be made in lieu of flowers to either: American Cancer Society 20470 Lorain Rd., Cleveland, OH 44126 or Crossroads Hospice and Palliative Care, 3743 Boettler Oaks Dr., Unit E., Uniontown, OH 44685..
To send flowers in memory of Mary K. "Kaky" Arnett, please visit our Heartfelt Sympathies Store. Provide comfort for the family of Mary K. "Kaky" Arnett by sending flowers. Dear Kim, Joel, and family, Abby and I want to extend our love and sympathy to you at this time in which you grieve the death of your mother (-by-marriage) grandmother, and great-grandmother. Having lost Abby's mother one year ago this month, we can relate just a bit to your grief at this time. May God's love and comfort through His Son, Jesus, whose death was followed in victory over death at His resurrection be real to you all in the days ahead. Kim and family, Iam so sorry to see you have lost your Mom. I worked with “Kaky” at Sparkle when we were both cashiers. Oh what fun we had at times. She was a wonderful friend to me at that time. Sadly, I lost track of her through the years.She was a great gal and I know she loved you dearly Kim. May the Lord wrap all of you in his loving arms as JESUS welcomes Kaky into her heavenly home. What a awesome lady example of treating humans well! God Bless Kim and Family!